One of the characters at Oxford Castle Unlocked is a man known as Rowland Jenkes who, while appearing at Oxford Assize Court in the 16th century, put a curse on the court and as a result, over 300 people died in the city of Oxford. It is a fascinating story brilliantly portrayed a fellow tour guide at Oxford Castle Unlocked. I am not going to give away the full story as you need to come on the tour and be amazed or even appalled by the facts. 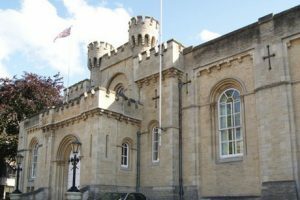 As a Police Officer working in Oxford up until 1985, there were two major Courts in Oxford. One situated in the Town Hall and the other in New Road, Oxford. Each court has its own character but both are full of history and atmosphere. The court in New Road is virtually next door to the entrance to the prison which is now a hotel. The court closed in 1985 and moved to a more modern building in St Aldates. The Assize Courts changed their names in the late 1960s and were renamed Crown Courts. I have given evidence on many occasions at the court in New Road. Number One Court is a a beautiful room seeping in history. Even for a seasoned Detective, giving evidence before a very senior High Court Judge can be stressful. You are smartly dressed and (hopefully!) give your evidence in a clear and concise manner. The surroundings inside the main hall at the Court almost passes you by as all you want to do is prepare yourself for the time you are called into Court but one thing I always noticed were the flags of the local Military hanging high above the floor detailing the various battles they appeared in, now thin with age. 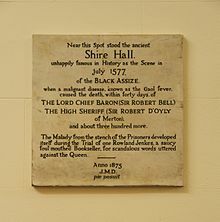 On the wall is a large marble plaque to commemorate the Black Assize. It was placed at the time of the erection of the Court in 1841 and is written in old English. Difficult to understand. It mentions the foul and saucy mouth of Rowland Jenkes and then goes on to mention some of those who died as a result of the curse, including all three Judges who tried his case. We are coming up to the anniversary of the Black Assize. It took place on 6th July 1577 and as a result of the deaths, the courthouse was demolished and the new one built in 1841. It is a fascinating story and well worth a visit to our castle to hear the full facts. Why not get involved and come along on the anniversary – 6th July? It’s only a few weeks away!